The muppets were laughing uproariously. And I had a moment of eye-rolling ironic realization that we’d better get all games of tag out of our system now. Because it’s probably not going to be allowed when my boys get to elementary school. When I was a kid I lived in a canyon community. Parents of kids on the street would coordinate the playdates (we lived in the hills so getting from place to place could be difficult), but once one of the resident 6-year-olds arrived, we’d head out to play. We’d ride bikes in the cul de sac. We’d roller skate down long driveways. We’d play – like kids do. We’d scrape our knees, jump out of tree houses and cause other kinds of chaos. These days you never see kids out playing. The streets are deserted. Society has ceased to allow childhood. We bear offspring and raise them from babies to pseudo-adults (the teenage years) with no middle ground. From the freewheeling era of hippies and baby boomers rebelling against the buttoned-up Leave It To Beaver suburban neighborhoods, we’ve regressed to a mindset of (lawsuit happy) infantile fear that the worst-case scenario is always right around the corner. I looked out at Search who had happily found a broom and was contentedly ignoring the others while he swept the portico ad infinitum. “Where’s your brother?” I asked, smiling out at him. “In the tree,” he replied matter-of-factly as he swept past. There was a collective scritching of chairs on the dining room floor as we all pushed back to peer out the sliding doors – searching out our skyward bound offspring. 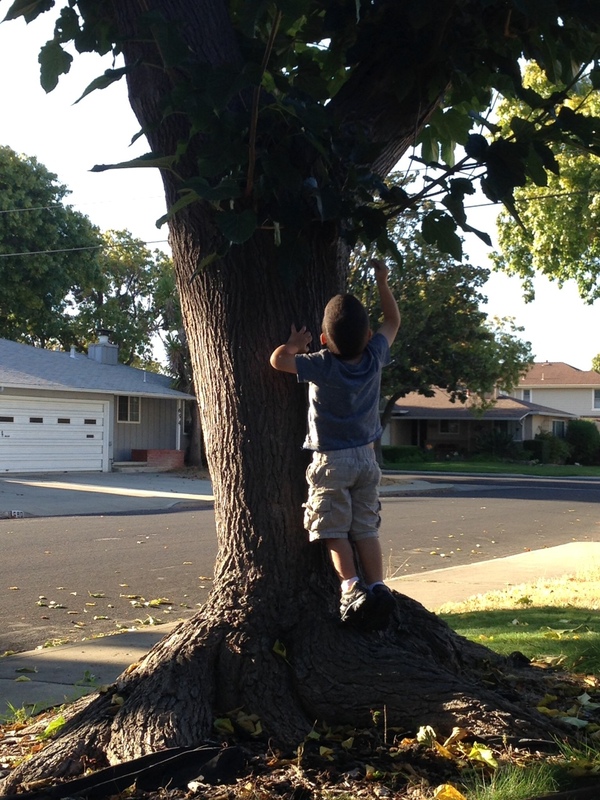 Sure enough, the boys’ new 5-year-old friend was animatedly pantomiming the finer points of tree climbing to her spellbound admirer. I later relayed this tale to a friend who hadn’t witnessed the event firsthand. “I hope you let him climb!” came the response. I’ve let my son fall; I’ll let him climb. By forcing our children into a bubble – fretting about any and every outlying danger that could possibly befall them (see what I did there?) – we actually do them a greater disservice. We are voiding our community of kids. Babied and fussed over for their entire lives, the next generation will be turned out into adulthood wholly unprepared. And I don’t know about you, but I’m not real thrilled with the idea of eventually being moved to a nursing home staffed by attendants who have to check with my fellow residents before they can make their next move. As a preemie parent, you may think I’d be that hyperventilating overprotective mommy. While I’m certainly not discounting my overall anxiety levels that average out around Defcon-5, our NICU experience actually relaxed me a bit. My sons proved they are fighters. I mean, if they could learn how to breathe how hard is it going to heal a possible broken bone? But mostly, they taught me to breathe. Survival includes letting them grow up; that means allowing them to be kids. Do you expect a bird to fly if the chick is never allowed to emerge from its egg? At some point we’re going to need to push them out of the tree. Hold your breath; watch them climb. Close your eyes; let them fall. I think the play is more contained than it was when we were kids. We roamed the neighborhood. Now all of that is done at a park or in a yard or at My Gym. We have become contained and watched. We have a park about two blocks away. I often wonder how old my kids will be before I let them ride their bikes to the park like I did at around age 10 or so. I have no idea. I agree that there is a lot more hypervigilence these days than before, but you can still find lots of kids out and about playing. It’s pretty normal on a Saturday or Sunday to have the kids on our street running from house to house playing whatever game they want. You don’t even have to call the parents to see if they made it to the next house, because you can hear them laughing all the way down the block. I was recently talking with a mom at our local playground that there are never any kids playing outside in my neighborhood. I know there are kids in the neighborhood but they’re rarely outside. It makes me sad for my kids because they don’t have anyone immediately available to play with…sometimes I just don’t feel like carting them off to a play date. When I was a kid we were outside by 10 a.m. and didn’t come home except for meals and for good once the street lights came on. Everyone was friends with everyone else. I don’t know how that’s going to happen for my kids. This may be something we have to look for when we start looking for a larger home.